Stowe and Andrea's web sites are good one to monitor as they often post new battle art that they create. If you have not seen them before, check out Stowe's new playing cards. Let me just say... Frost Park today was awesome. I loved chalking with my son. I let him draw whatever he wanted and then I came in behind him and fully realized his madness. I love his manic glee about the whole thing. It has been one of my favorite art experiences ever. Trading card and possible inspirational source for Stowe. Trading card and possible source of inspiration. Photo by RR Anderson. Stowe has now produced 8 trading cards on the Frost Park Chalk Off Challengers. The ones Stowe hands out look pretty good. It would be great for these to be be able to see all of these produced and stamped out professionally with the right lamination, card stock and corners. Anyone know a good printer so they look like sports or Magic the Gathering cards? So far, there is no known way to acquire them from Stowe other than having him hand the few he has produced. Yet, I think (and hope) eventually they will find themselves into Feed Tacoma Shops. A smaller preview version of Andrea's new piece showed up on the comment thread for Episode XI. Had a satisfyingly cathartic time creating the banner and promo poster for this week's Chalk Challenge. Prints of this and others will be made available for purchase at the upcoming Urban Arts Festival. Here, RR combines his many themes including perhaps Lance Kagey's earlier promise to show RR "how to draw." Note the generic form for the designation of Episodes numbers making the ad applicable to any week necessary up to week 99. Here it is folks, the much awaited fashion ad by Urban Xchange featuring Frost Park Challenger Stowe who prevailed in Episode IX. The ad comprises nearly a third of the page. All due to a good day of artistic chalking. Stowe ended up doing alot of graphic design as well resulting in a great ad. RR Anderson's Holistic Forge Works is mentioned as well. Nice work Stowe. Frost Park events are about people, not technology. Yet, the Frost Park events are certainly enhanced greatly by the internet, photography, individual blogs, Feed Tacoma and and endless number of other devices. This week, University of Washington lecturer Andrew Fry pushes the technological envelope even further in Frost Park. Now I am going to be put to the test. I am going to attempt to write some fiction, 140 characters or less at a time. This will be done using the Beta version of a new online writing and posting service called Quillpill. Thank you to Jamie Paulson from www.thriceallamerican.com for bringing it to my attention. So I will attempt to write something at 140 characters per entry, with only 1 to 4 entries a day. But it must be epic, it must be important and it must be relevant. Therefore, I will attempt to write the story of Chalkoff Challenge XI. 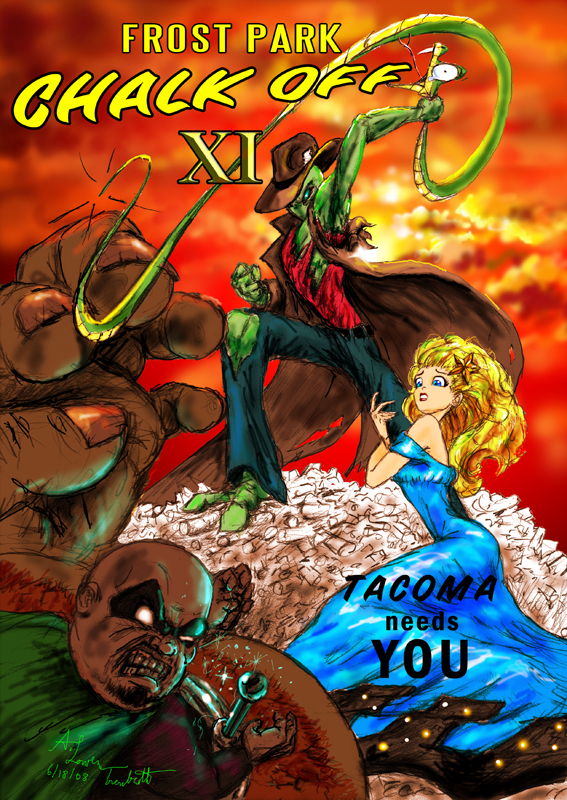 Read his quillpill entry here of Frost Park Episode XI. No known Tacoma art event has used such a volume and variety of technology as Frost Park Chalk Offs. This addition takes Frost Park even further into the technological forefront. Thanks for keeping us on the leading edge Andrew. We look forward to the next write up of future chalk off Episodes. I regret to say, however, that this will be the last Chalk Off I'll be able to participate in for a while. As some of you may know, I'm heading down to San Francisco for a couple months, on Wednesday, to basically take a breath and look around. I'll keep a box of chalk handy for when I return. Frost Park was graced with the presence of Electric Elliot in Episodes IX, X and XI. Electric Elliot produced what is essentially the Frost Park Chalk Off trailer which we will have to remember him by. Tacoma and Frost Park await your return Electronic Elliot. by NineInchNachos on 6/24/2008 @ 12:41am looking for volunteers! if you're a reader of the weekly volcano, and you come across my 'learn to draw' ad. please take the time to scribble away the appropriate 'bars' revealing the correct chalk off number for the next reader. fold and place back in the stack. blow the next reader's mind! by morgan on 6/24/2008 @ 11:13am Interesting! I didn't think we were up to 88! by Erik on 6/24/2008 @ 11:35am Interesting! I didn't think we were up to 88! Those are blank virtual number slots good up to 99. RR didn't want to date his ads until we reach episode 100. Speaking of which we need volunteers to wash of Frost Park like Dave L. did last week so that our artists have a clean "canvas" for this Friday. Clean chalking surfaces makes the chalking entertainment at Frost Park possible. All one needs is a bucket for the sidewalk. A light brush helps with the vertical surfaces. It takes two people, showing up spontaneously, about 10 minutes. by Dave L. on 6/24/2008 @ 12:25pm (Not that I wouldn't help, though.) With the chalk that most people are using, a single bucket of water and a hand scrub-brush makes quick work of the vertical surfaces. The sidewalk itself goes even quicker. Just enough energy expelled to require a refreshment at a local establishment with fine company. by izenmania on 6/24/2008 @ 1:38pm I believe that a number of different people volunteered (even expressed vague disappointment that Dave had beaten them to it last week). by Dave L. on 6/24/2008 @ 3:07pm O.K. - I guess I'm as good a person as any to get the clean-up party a regular thing. 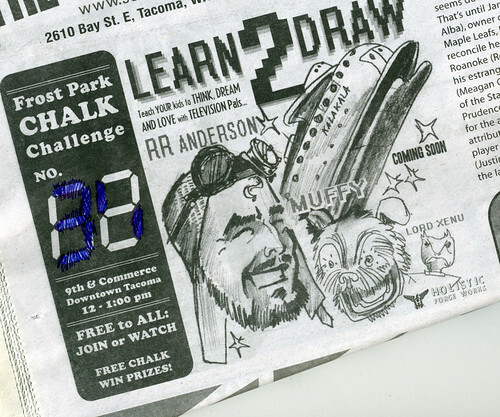 Wednesday sounds like a good day for a weekly Frost Park chalk cleanup party. BUT this week Iâ€™m busy Wednesday. So this week, letâ€™s do Thursday, 7:00 p.m. If itâ€™s convenient for you to bring a bucket and brush, please do. But if you donâ€™t have one, or are riding the bus or bike, etc., Iâ€™ll try to have stuff there to use. After this week, letâ€™s do Wednesdays, unless Thursdays just works out for more people. Please comment if you have a preference of day and time. Iâ€™d like to keep it consistent week-to-week, but I also want to make it the most convenient for those wanting to help clean. Two people would be great, but the more the merrier. See yâ€™all THURSDAY, 7:00 P.M.
by izenmania on 6/24/2008 @ 4:11pm So let it be posted... so let it be done. by Erik on 6/24/2008 @ 4:46pm See yâ€™all THURSDAY, 7:00 P.M. Thanks for leading the brigade Dave L.